Photos - (from left to right) Jimmy Choo, Kate Moss and Intimately Beckham by Victoria Beckham. 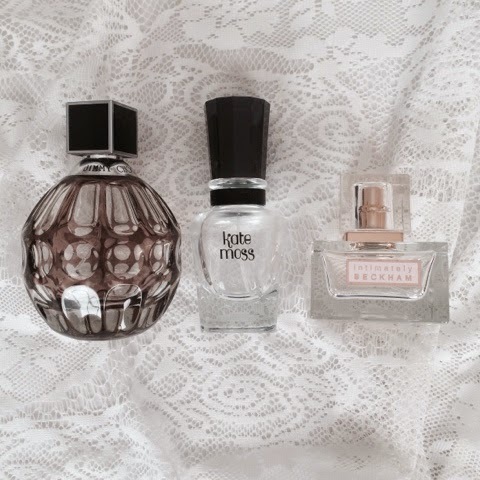 So far I have three empty perfume bottles. They have just been lying around my room so I thought that I would do a review about them and share my thoughts on each one with you guys. First of all, I have to say that Jimmy Choo is my favourite of the three (trust me to love the most expensive one, right?!). There are a few reasons for this, look how pretty the bottle is! It is such a simple design, yet grabs your attention due to the way the bottle has been shaped and moulded (this sounds really weird but hopefully you'll understand if you have this perfume). I also love the smell, of course. It's quite sweet and very feminine, my favourite type of scent. This perfume is very glamorous and I only wear it on special occasions or when I just can't resist as it is a strong and long lasting fragrance. The second perfume I am going to talk about is the Kate Moss perfume. Firstly, can we just appreciate that this perfume is £10.99!! An amazing smelling perfume for this low a price is just crazy! You have to buy it! Now that that's over.. I really love this perfume not just because of it's price, but because it's a really fresh and sweet scent. Again, it smells very feminine - which is a must for me when buying perfumes. 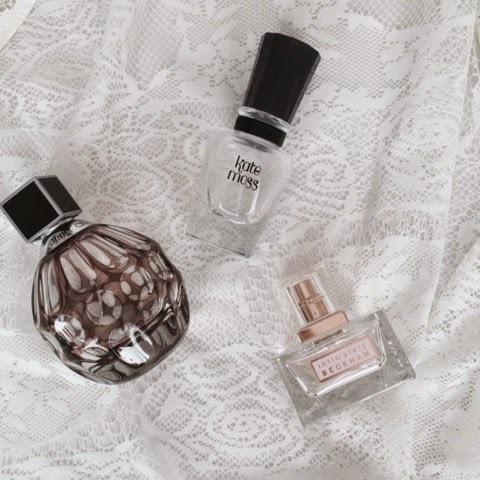 I have re-purchased this perfume three times so far and I continue to do so until it gets discontinued! The third perfume is Intimately Beckham by Victoria Beckham and this perfume is also very inexpensive (£20!!). Just to repeat this again, it is another feminine scent but this time has muskier undertones and is slightly more mature than the other perfumes. I wore this perfume on a day-to-day basis as it was also quite fresh and day time appropriate. This perfume could definitely be worn on an evening as well though. I have re-purchased this item twice and I will definitely be re-purchasing it again soon!